Temporary profession of five second year novices namely Anisha Benjamine Gonsalves, Josephin Mary, Moksha Rakini, Prathima D Souza and Sherin Salma was held at Maria Niketan Chapel, Bogadi. Most Rev Dr Thomas A Vazhapilly Bishop Emeritus presided over the Eucharist. Rev Fr Stany D Almeida preached a befitting sermon on this occasion. 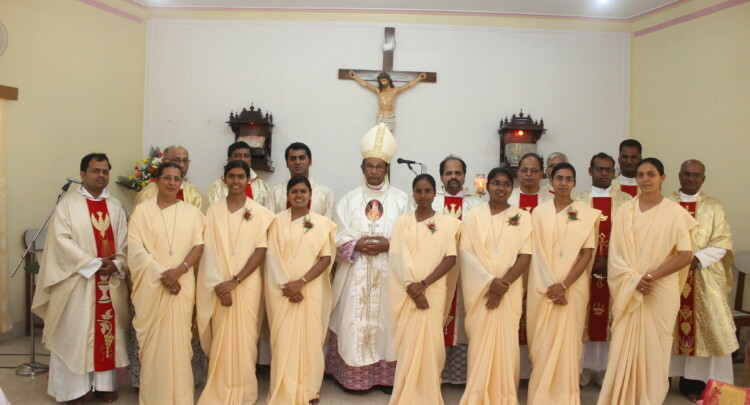 The five Sisters pronounced their vows in the presence of Rev Sr Apoline Cordeiro, Provincial Superior. Priests, Brothers, Sisters, parents of the Sisters joined them in praying.